Robyn Vilate: simple. ment. chic. ahh...the blossoming trees. it truly is starting to feel like spring! yesterday hubs drove home one of his convertibles (for those of you who don't know, we own a car lot, hence all the crazy and different cars we drive) and we took it for a little ride. it felt amazing and i realized how ready i am for the cold to be gone for good and for "putting the top down" season to start! then of course today it got cloudy and windy again and the top was back up. haha. i was barely able to take my coat off for a few pictures so you could actually see what my tee says before i was shivering! oh well. we know it's coming and that's all that matters! also, it's giveaway time! stella & dot is doing an awesome giveaway for this fab bracelet below! giveaway will end this sunday and the winner will be announced monday! good luck!! 4. I would love to win this bracelet. It's beautiful and simple and one of my most favorite colors! It would just be perfect to wear to my wedding shower in May. I just love this bracelet and hope you pick me! love the jacket and tee! I am obsessed with the color turquoise lately! I would absolutely love to add this little gem to my collection! Love!! I would love to wear this darling little bracelet on the tennis courts. I'm pretty sure it will improve my backhand swing...or atleast it'll be the envy of all the ladies at the club! I would love to win this bracelet because who doesn't love turquoise in the summer??? :) Fingers crossed! Would love to win.. Perfect for summer. 1. I'm a follower of Cleverly Yours! 2. I'm a follower of @robynstew8 and @melissafielitz on instagram! 3. I follower cleverly, yours and stella&dot by melissa fielitz on Facebook! 4. I would love to win this bracelet because it is super gorgeous! 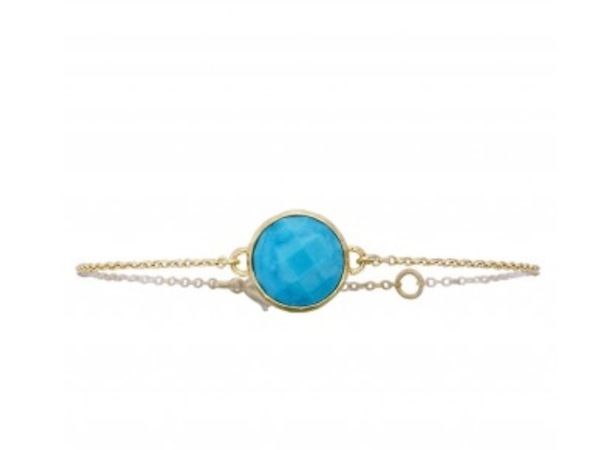 Love the color of this bracelet and I love that its so delicate! This would be an awesome win!! Just found out we are expecting our first in November... I'm excited to start following you and get ideas on how to dress my pregnant self. Plus, a new little something would just sweeten the deal! Love this delivate and adorable bracelet! My roommate used to be a rep for stella&dot and I always loved their gorgeous jewelry! Did all the steps! OMG. Lovin this bracelet. Simple.Cute.Fabulous. I love jewlery that is petite looking, it just looks classy somehow! (: Hope to win! done, done, done, done, and done :) would looove to win the bracelet, it's beautiful! did it all! I love this bracelet! So simple but soooo pretty! I liked all of the platforms! I ADORE the dainty, thin, beautiful delicate chain! The turquoise gem is really such a beauty. I love this bracelet and would wear it EVERYDAY because it goes with EVERYTHING! It really would be an honor to own a beautiful piece of jewelry from Stella and Dot. Love the outfit too! It is very effortless and chic at the same time. Nice job!